The 72-day mission saw InflateSail demonstrate the effectiveness of using a drag sail in Low Earth Orbit (LEO) to dramatically increase the rate at which satellites lose altitude and re-enter the Earth's atmosphere. The mission is also believed to be the first successful use of inflatable structures on a CubeSat in space. There are 7,000 tonnes of space junk in orbit, all traveling at speeds of up to 17,500 miles per hour. It's hoped that the success of InflateSail will prevent future satellites from contributing to the space junk, and from being involved in any potentially disastrous collisions. 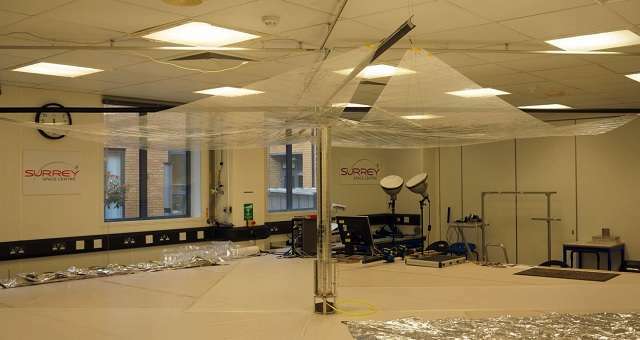 Professor Craig Underwood, Head of SSC's Environments and Instrumentation Group and Principal Investigator for the mission at University of Surrey, said: "The success of the InflateSail mission once again shows that the University of Surrey is at the forefront of innovative space technologies. This mission produced a wealth of data, which has given new insights into these key deorbiting technologies, working in the real space environment. "We are clearly at the precipice of another space race, fuelled by exciting new privately funded companies. However, with this new interest comes the potential to add to the increasingly unsustainable and dangerous space debris problem. We see a future where structures similar to InflateSail are used in space missions – where at the end of the satellite's life, the sail is deployed and, very quickly, the satellite will be dragged into the Earth's atmosphere." The team at SSC are also looking into ways to reduce the space junk currently in orbit, and next year will launch the RemoveDebris mission, that will see various methods tested to remove some of the debris from space. Professor Underwood said: "What we are also looking into is how we can deal with the many objects already in space. This is a far more complicated problem as we have to 'meet up' with these objects and bring them down. Our next flagship mission, RemoveDebris, will be one of the world's first missions to test technologies for us in capturing space junk with a net and harpoon." Once we start using woven carbon nanotube for structural support members, inflatable craft like this will be much more robust.